Did the Shiv Sena just pick being in govt over Maharashtra farmers' welfare?! The Shiv Sena, after days of vehement agitation in support of the loan waiver for farmers in Maharashtra, have back-tracked and have withdrawn from it. The ongoing Budget Session of the Maharashtra State Legislative Assembly came as an opportunity for the opposition parties to corner the government on a burning issue like farmers’ suicide and agrarian crisis in the state. However, the momentum built by opposition parties with the help of Shiv Sena fizzled out when the party took a sudden U-Turn. After Bharatiya Janata Party (BJP) promised a crop loan waiver if voted to power in Uttar Pradesh, the opposition parties in Maharashtra, too took up the issue aggressively. Initially, parties like the Congress and the Nationalist Congress Party (NCP) started demanding the crop loan waiver hoping for political mileage. As the issue started heating up, Shiv Sena too realised the importance and jumped on to the bandwagon. Despite being in power with BJP, Shiv Sena started vehemently demanding a crop loan waiver for Maharashtra's farmers. Shiv Sena executive president Uddhav Thackeray went to the extent of ordering his party MLAs not to let the House function till government announced a complete loan waiver. The opposition parties took up the issue right from the first day of the ongoing Budget Session of Maharashtra State Legislative Assembly that started last week, and the Shiv Sena too joined them in disrupting the proceedings. The political gimmick, that worked in BJP's favour in Uttar Pradesh, was all set to snowball into a serious trouble for Chief Minister Devendra Fadnavis. The stand taken by Shiv Sena stunned the the Opposition. As if this was not enough a shocker for them as well as the ruling BJP, Uddhav Thackeray made it a prestige issue and announced an agitation that would continue till the demand is fulfilled. The move was seen as a major blow to Fadnavis government. The leaders from Congress and NCP even prepared to take the Shiv Sena in their fold and try to topple the government. Senior Congress leader and Leader of Opposition in state Legislative Assembly Radhakrishna Vikhe Patil had indicated that the government might face a no-confidence motion in the Budget Session. “There is no permanent enemy in politics. We are committed to the farmers’ welfare. There are possibilities of new alliances in the state. I do not rule out no-confidence motion against the government in the Budget Session,” Vikhe Patil had said. When speculations were rife, even Uddhav Thackeray, too dropped hints of new alliances. This boosted the confidence of opposition parties hoping to come to power again. All this fanfare for what? Shiv Sena launched the crop loan waiver movement with much fanfare. Thackeray convened an emergency meeting of all his MLAs two weeks ago, ahead of the Budget Session. During the meeting, he reiterated that the Shiv Sena was not power hungry and his ministers would resign from the government any moment. Immediately after the ‘order’ to not let the House function, Shiv Sena MLAs started showing aggression for the demand. A delegation of Shiv Sena MLAs even met CM Devendra Fadnavis to press for the demand. Following the meeting with Shiv Sena delegation, CM Fadnavis led a delegation of ministers from Maharashtra to meet the union agriculture minister in New Delhi on Friday. But soon after the meeting, matters took a dramatic turn. The highly vocal Shiv Sena leaders suddenly changed their tune and called off the agitation. The sudden change of stand caught the Congress and NCP on the wrong foot and all the plans of bringing in a no-confidence motion were shattered. “The tiger has been tamed and surrendered to the BJP. It is highly unfortunate that the Shiv Sena is more worried about the perks of being in government rather than working for farmers’ welfare. I fail to understand the reason behind the U-Turn by Shiv Sena leaders who made tall claims till two days back,” said Leader of Opposition in State Legislative Council Dhananjay Munde. Munde alleged that the Shiv Sena had double standards on such a vital issue which concerns lives of thousands of innocent farmers in the state. Fadnavis said that there are in all 31 lakh farmers who have defaulted on crop loans, and hence not eligible for further loans. The state will need Rs 30,500 crore to waive off the loan. “We want to help farmers. But loan waiver is not the final solution to the problem. Efforts need to be made to improve investment in the agriculture sector. The investment pumped in to the agriculture sector over the last two years has resulted in a never-seen-before the growth of the agriculture sector,” he said. Fadnavis said that government was putting in their best efforts to make farmers self-reliant and to reduce their dependence on loan. Water supply schemes to drought-hit areas would be completed in four years. Rs 1,200 Cr for Jalayukta Shivar Scheme. Rs 8,233 Cr for irrigation department. Farmers’ income to be doubled by 2021. The current growth rate of the state is 9.4%, which is expected to be double-digit next year. Rs 979 Cr for agriculture pumps. Rs 125 Cr for Punjabrao Deshmukh Interest Concession Scheme. Rs 8,233 Cr already provided to irrigation department. 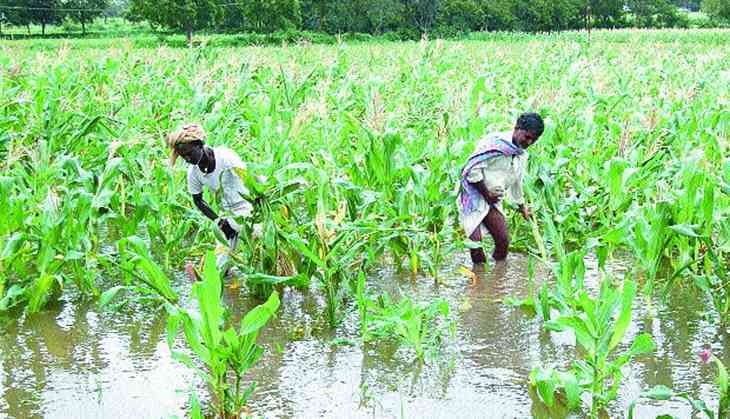 Rs 2,812 Cr for Prime Minister Agriculture Irrigation Scheme. Rs 250 Cr for the first phase of Krishna – Marathwada Water Supply Scheme. Rs 225 Cr for farm ponds and wells under MNREGS. Rs 100 Cr for micro irrigation schemes at Arvi in Wardha district and Bembala in Yavatmal district. To provide cold vans for transportation of agricultural produce. Rs 200 Cr for pilot project of group farming. Rs 4000 Cr Nanaji Deshmukh Agriculture Rejuvenation Project with the help fo World Bank. Rs 92 Cr for Dr Babasaheb Ambedkar Agriculture Self-Reliant. Rs 71.78 Cr for construction of eight jetties under Sagar Mala project. Rs 100 Cr for MIHAN project at Nagpur. Rs 1000 Cr for concessional power tariffs to attract industries in Vidarbha and Marathwada. TWEET THIS Shiv Sena drops out of Maha crop loan waiver agitation, NCP, Cong caught on the backfoot Did the Shiv Sena just pick being in govt over Maharashtra farmers' welfare?! READ NEXT >> Will Salman Khan and Katrina Kaif be back together?